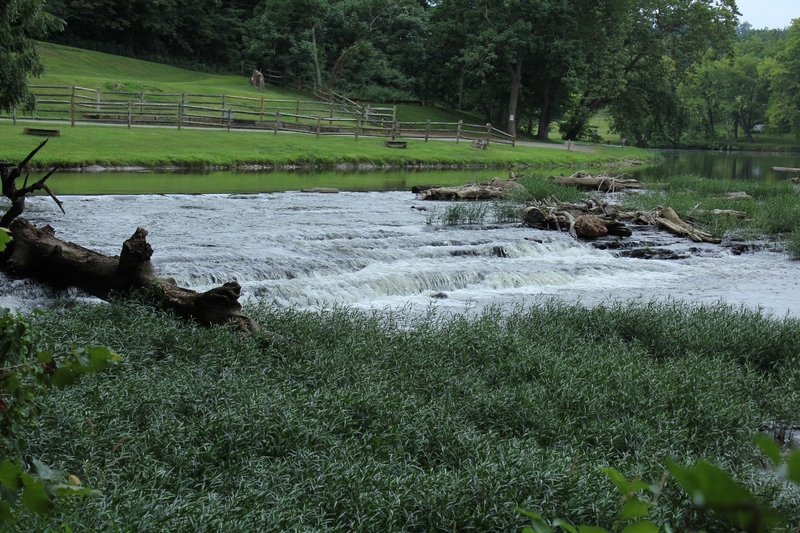 This is the second article in my short series on the New River. 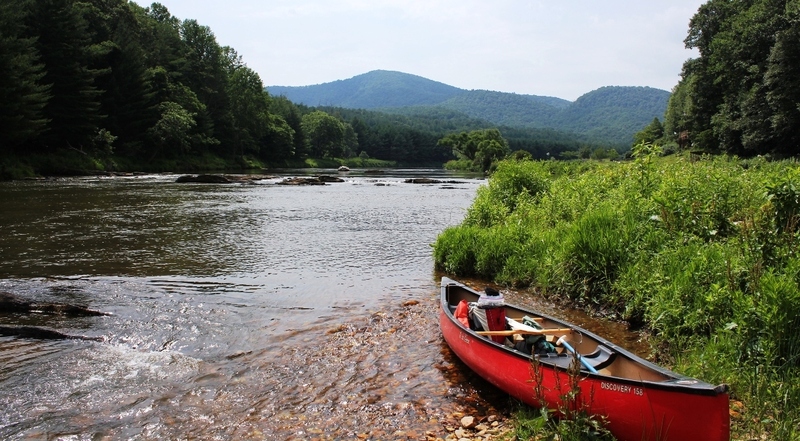 This summer we canoed and fished several sections of the New River, first exploring the upper section in North Carolina, then the middle section that flows through Virginia, and finally the section that flows through the New River Valley and into West Virginia. 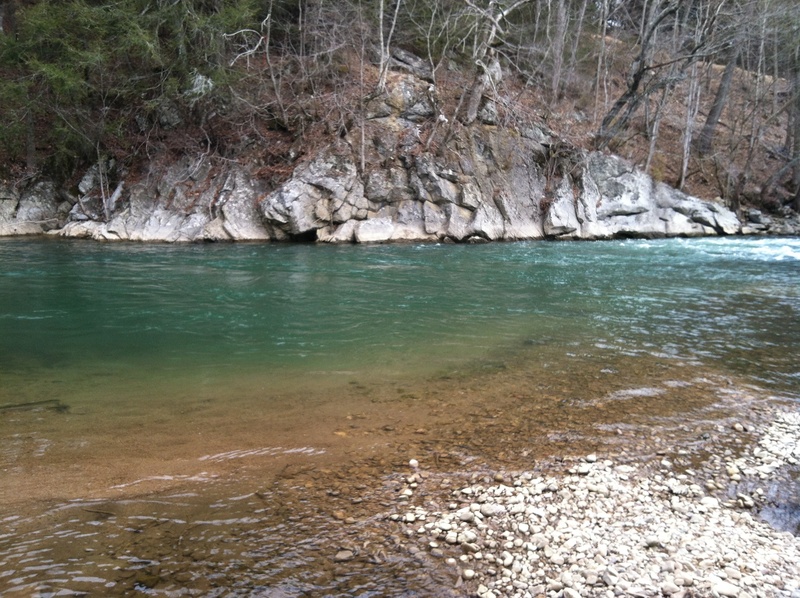 In the first article, I reviewed the section of the New River below the confluence of the North and South forks of the river. 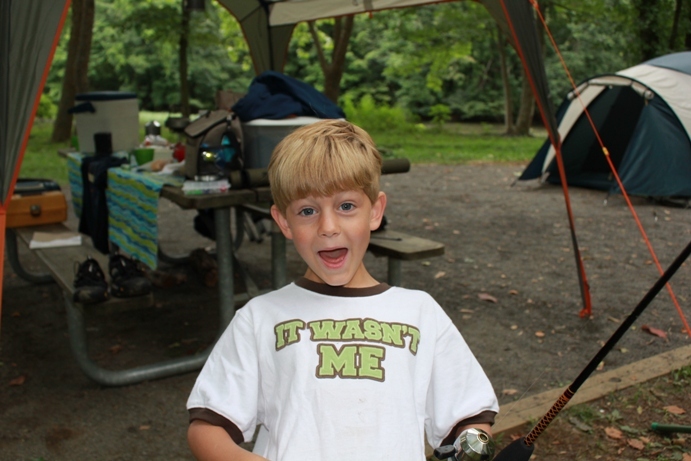 This article is about our second trip where we fished and camped at Foster Falls in August 2011. 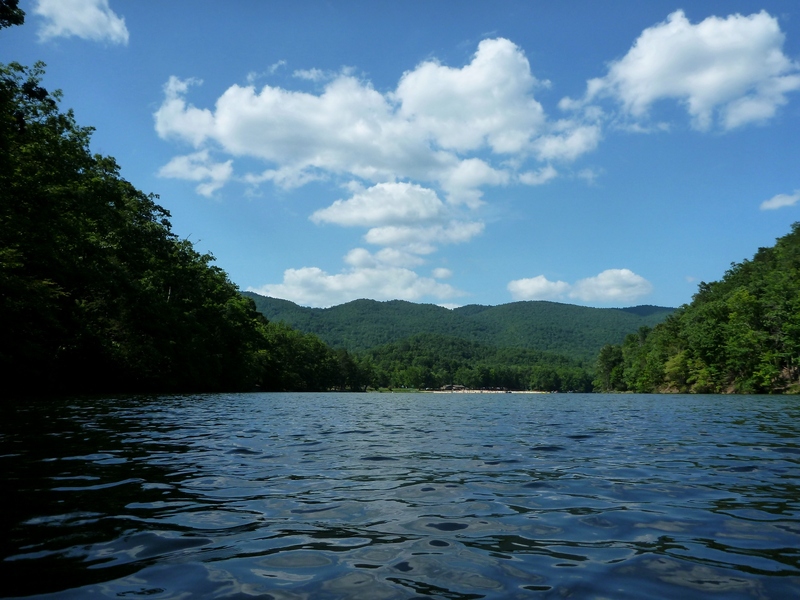 The New River leaves Ashe County and Alleghany County in North Carolina and crosses the state line and flows into Virginia at Mouth of Wilson in Grayson County. It then briefly crosses back into North Carolina and then back into Virginia again near Fries, Virginia. 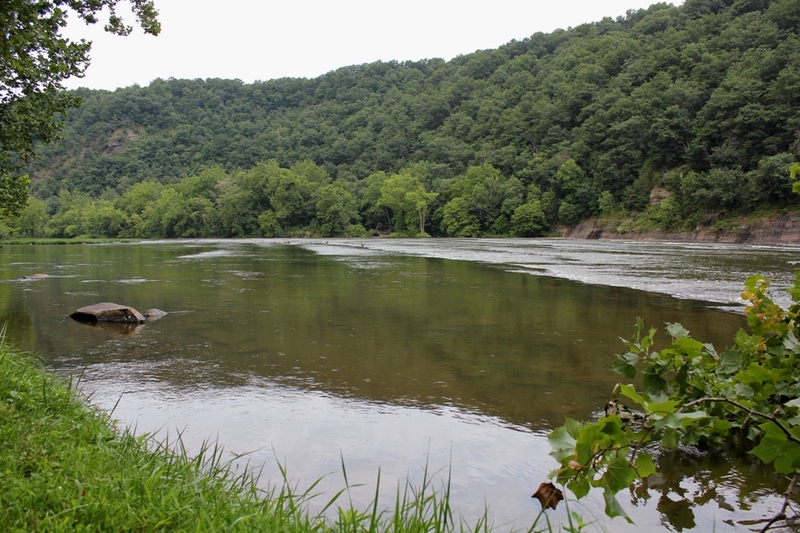 The river then flows through the eastern part of Grayson County and into Wythe County. 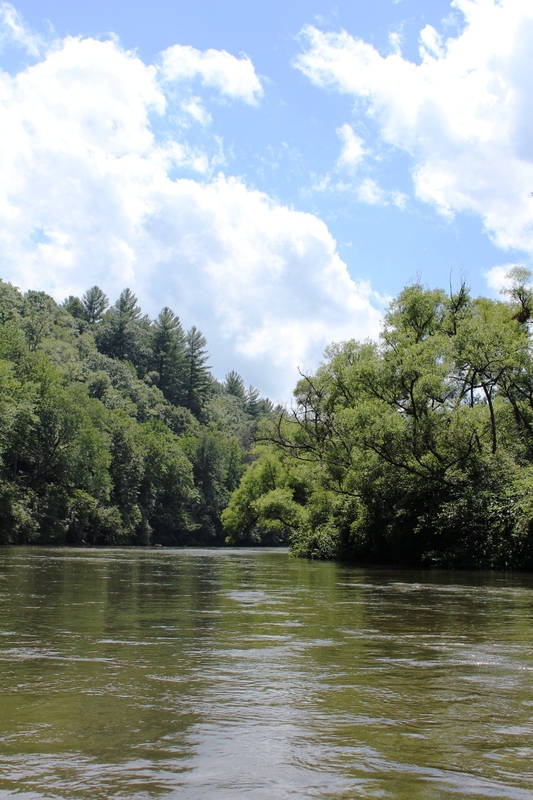 As the river flows through the eastern part of the Appalachian Mountains in these counties it gains considerable volume and size as various tributaries add water to its flow. Shortly after flowing under I-77, the New River has a series of step-like waterfalls that spand the entire width of the river and are collectively classified as a class 3 whitewater. This area is known as Foster Falls and is the site of Virginia’s New River Trail State Park. 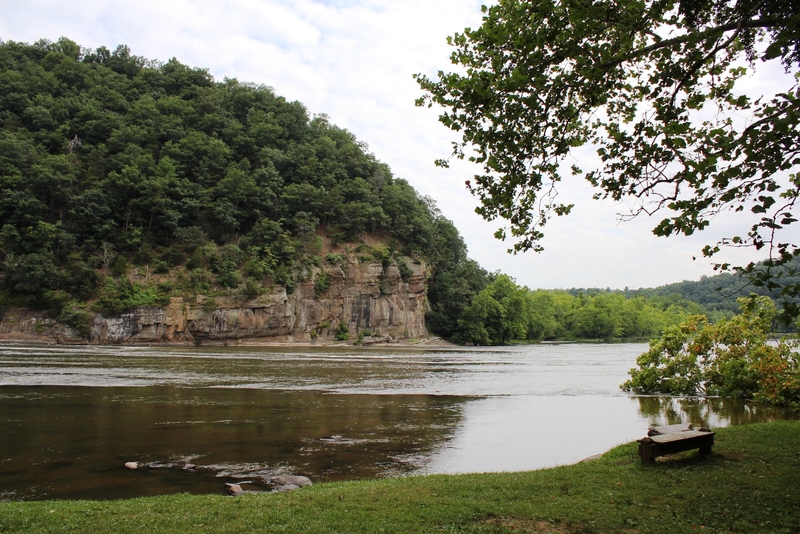 The New River Trail State Park is a unique Virginia park: A 57-mile linear state park with various facilities located at different segments of the trail. 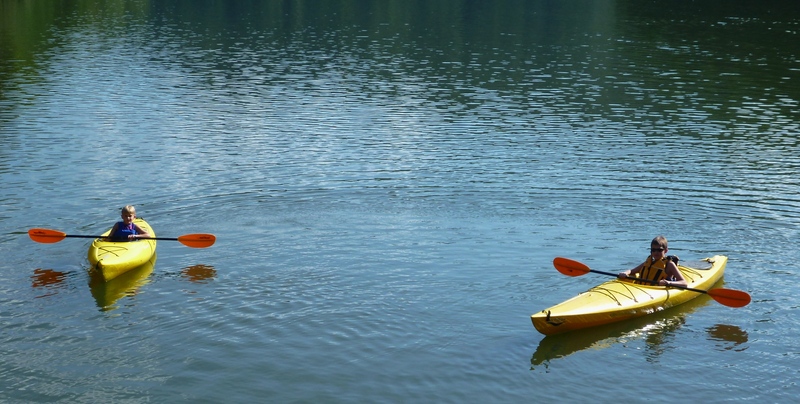 The main facilities are located at Foster Falls, where there is a small “walk in” campground, river access for fishing and a boat ramp, picnic areas, horse stables, and a canoe livery with a small shop. The New River Trail itself is a converted railroad bed. The trail is a packed dirt/ash trail that is excellent for mountain bikes or cross bikes. The trail has several trestles that cross the river and also has a tunnel or two that cyclists travel through. The trail is a level grade, with only a few minor hills, and generally follows the New River between Fries and Pulaski. Foster Falls is the approximate half-way mark on the trail, and makes a good base camp to cycle in either direction on the trail. This trail is scenic with minimal traffic and road crossings. After the Virginia Creeper Trail, it’s probably the nicest off-road cycling trail in Southwest Virginia. There are several areas to fish right at Foster Falls. I believe the key to fishing any large river, but especially the New, is to spread your casts methodically over fairly large areas of water to reach the most fish as possible and then move on. Unless you are bait fishing and patient, covering a section of water and then moving on to another section is the best way to cover this river. We therefore first bank fished the river, then waded parts of the river where it was shallow and fished across a large island adjacent to the campground. I fly fished with streamers and caught about 10 smallies with a size 8 olive wolly bugger. My sons Karl and Isaac used Mepps and Blue Fox spinners on light and ultra light spinning tackle. They caught about a dozen fish between them. Foster Falls campsite. The New River is seen right behind the campsite. There are only 12 campsites at Foster Falls. Thus, although it is a group camping area, the sites are dispersed and there is a wonderful absence of what I sometimes call the “Camp Jellystone Effect”−hundreds of sites jammed together creating a permanently smoky area that from a distance resembles a foreign refugee encampment as sometimes seen on the evening news. Also, because these are “walk in” sites, there are no RVs or trailers. You have to park in a designated parking area and carry your camp gear between 100-200 feet to the designated campsites. This is not that difficult, and, much to my surprise, the state park provides little wagons for campers to transport their gear from the car to the campsites. 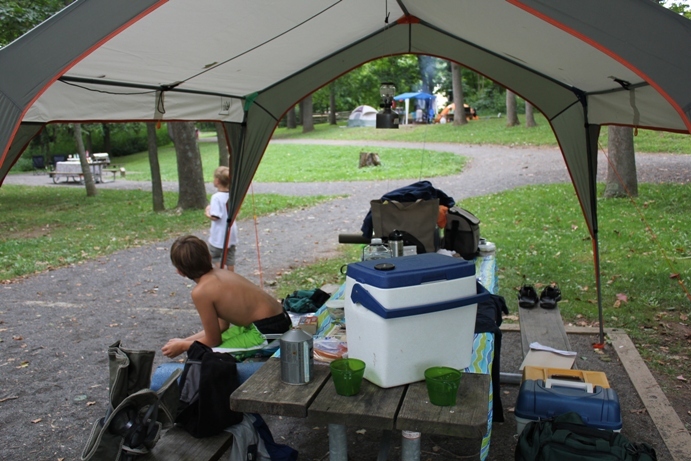 Most of the campsites are either right on the river, or very close to the river (with river views). The camground also provides a sheltered area with dry wood for the campers. You simply have to pay a daily fee, and then you may transfer the firewood to your site for your own use. This was convenient and a reasonable way to provide firewood (if you run out, you simply go back to the covered area and get a few more logs). Although we didn’t do any boating, there is the possibility of boating both up river and down river from Foster Falls. Running the falls looked a bit sketchy. When we were there in August, there did not appear to be sufficient water to successfully navigate the falls. We saw one kayaker dragging his kayak down the river; it didn’t look fun. I have kayaked the section of the river above the falls previously (my brother-in-law once took me down this section when a summer lightning and thunderstorm developed in which I feared for my life−getting caught on the water under these conditions can be scary). During higher flows, this can be a moderately challenging kayak with lots of riffles and fast water, but there are not too many obstacles. Downriver from the falls the river slows considerably as it approaches and eventually forms the upper part of Claytor Lake. We will definitely return to Foster Falls, probably with a bike focus on our next trip. However, I will also have to bring more marshmellows, Hersheys chocolate, and graham crackers next time. Because this time, these ingredients seemed to mysteriously disappear each night. Someone was stealing the S'mores. Who Was It? 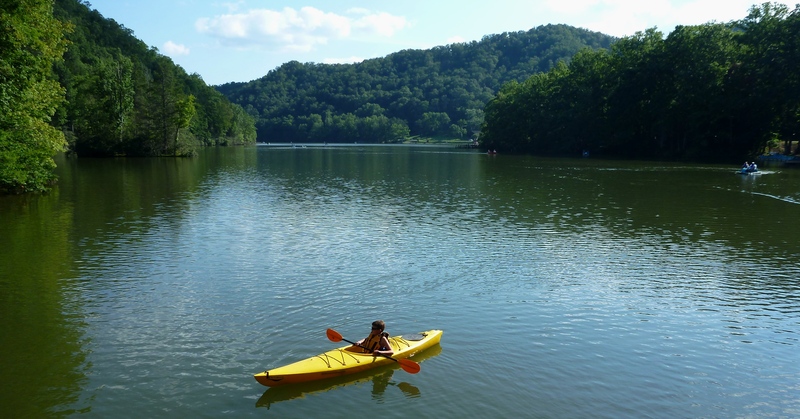 This is the first of a short series of articles that will examine the New River, the largest river which flows through Southwest Virginia, and the source of great outdoor opportunities in the region including paddling and fishing. Purportedly the second oldest river in the world (only the Nile in Africa is older), the New River predates the Appalachian Mountains (themselves some of the oldest mountain ranges in the world). Geologists explain that this river existed before the tectonic shift that caused the uplift of the Appalachia range. The river more or less continued its present-day path during the tectonic shift, cutting through the mountains as they were created. The New begins high in the mountains of northwestern North Carolina. The New actually starts as two rivers, the North Fork and South Fork of the New. These two forks join in Ashe County before flowing north and west through Virginia into West Virginia. The mighty New ends when it confluences with the Gauley River to form the Kanawah River, which flows into the Ohio River at the West Virginia/Ohio state line. 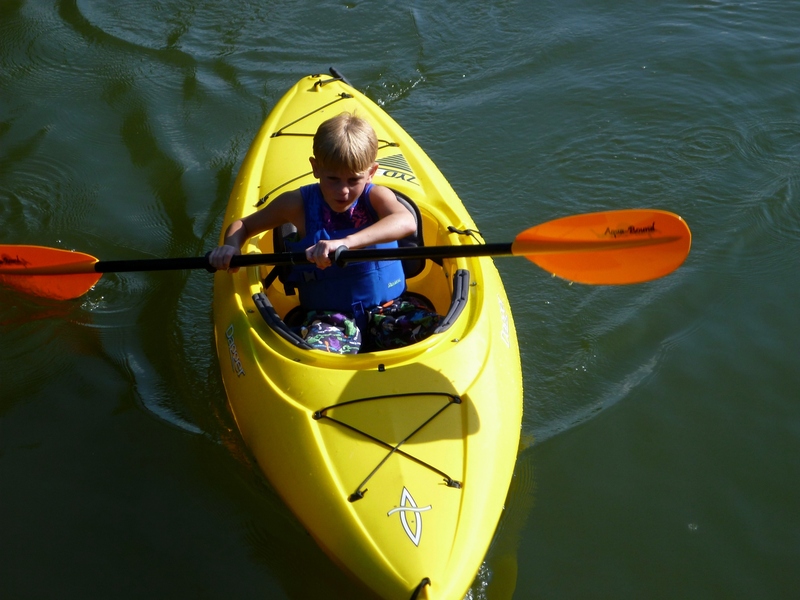 My son Karl and I did our own “section” paddle trips and travels to different parts of the New River Blueway, or paddle trail, over the course of this summer. For non-hiking readers, a “section” hike is the partial completion of a long trail, like the Appalachian Trail, in “sections”. Most hikers on the AT, for example, are section hikers, not thru hikers. We applied this concept to the New River, taking on several distinct sections of the river to observe and experience the river along its course. This article is the trip report about the first section. 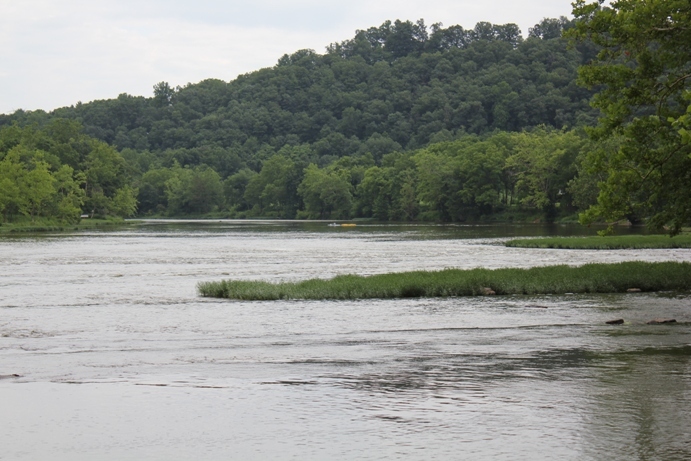 In June we travelled from Abingdon to Ashe and Allegheny County to paddle a 13-mile stretch of the South Fork of the New (above the confluence). This section of the New is part of the New River Paddle Trail in North Carolina. 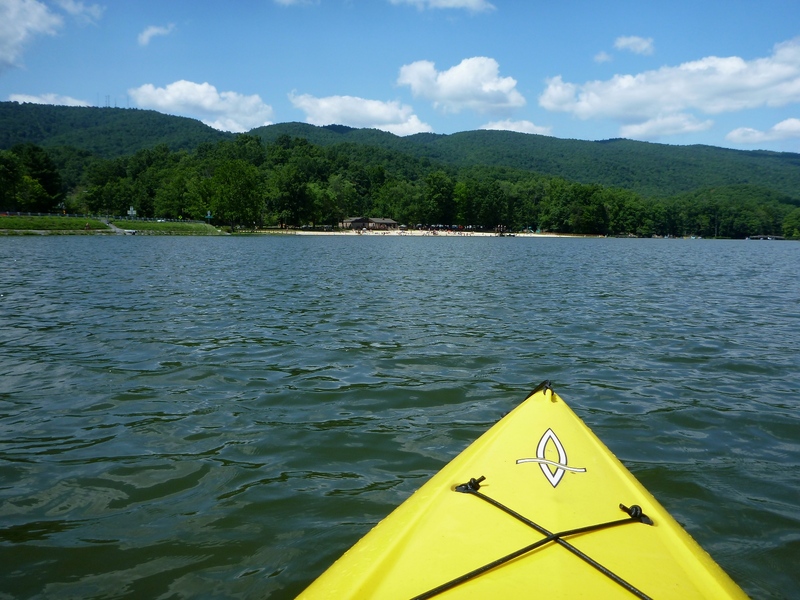 An excellent map of the New River Paddle Trail in North Carolina is here. possess outstandingly remarkable scenic, recreational, geologic, fish and wildlife, historic, cultural or other similar values, [and] shall be preserved in free-flowing condition, and that they and their immediate environments shall be protected for the benefit and enjoyment of present and future generations. In North Carolina the New River is still a moderately sized river. Both the North Fork and the South Fork are navigable. 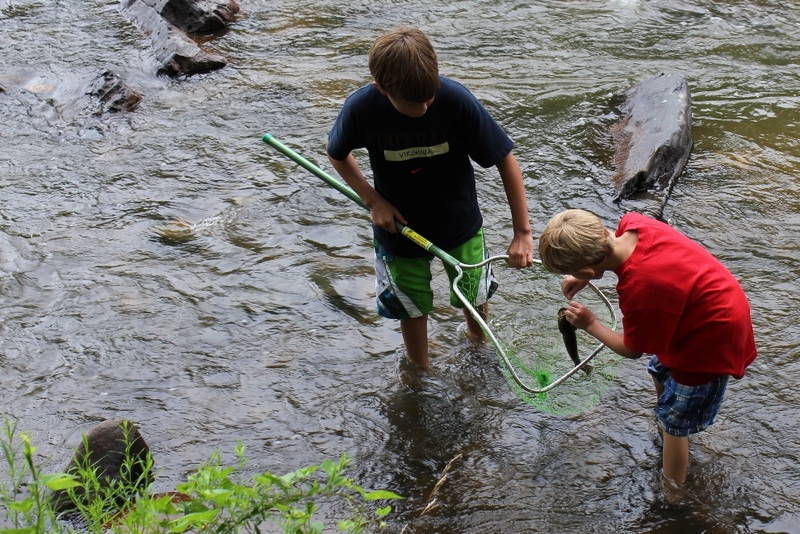 There are apparently some trout in the upper reaches of the New River, most notably high on the North Fork section. However, where we were paddling the river was already somewhat warm (compared to trout waters). The section of the New from the confluence to the Virginia state line is supposed to be a fairly good smallmouth fishery. We were above that section. 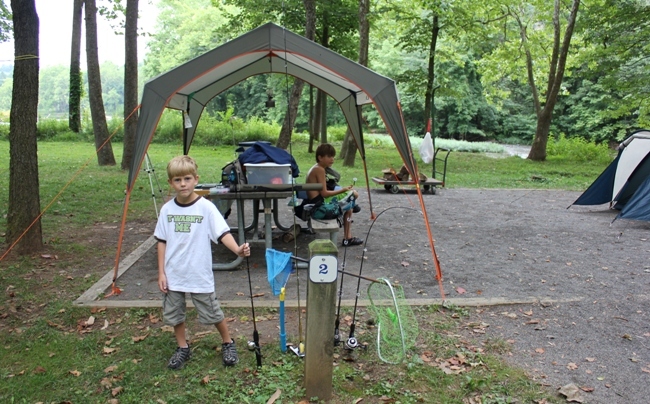 We fished the 13-mile stretch of the South Fork intermittently with light spinning tackle, and did not catch anything. The flora up in the North Carolina High Country is a bit different from down in the New River Valley in Virginia. 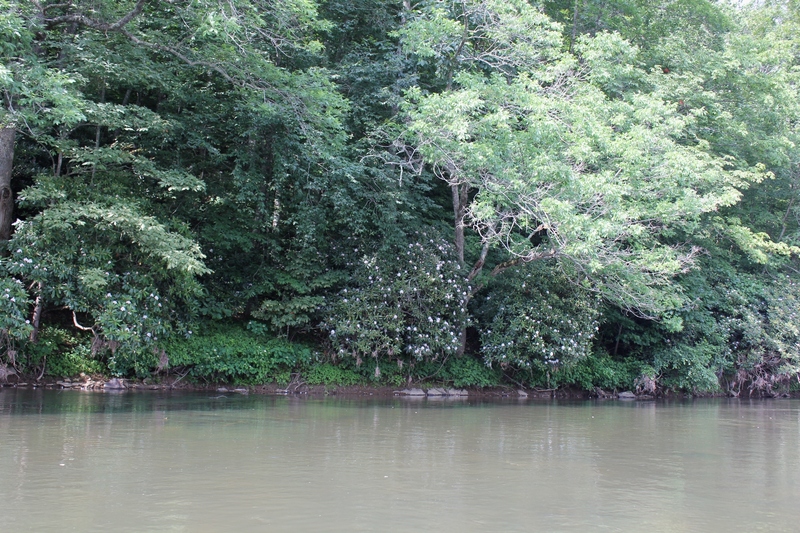 For example, there were rhododendron on the banks of the river and stands of pine trees mixed in with the hardwoods. Make no mistake, although moderately sized, this is still a powerful river. There are numerous boulders and riffles that I imagine cause current changes to a much greater extent when the river is at a higher cubic feet per second (CFU). We ran the river in low water, however it is probably quite a different river during the springtime. On this section of the New, where it is designated a National Scenic and Wild River, there are relatively few homes or other signs of development. You go through whole sections of river where the trees come right down to the water, and there are no homes visible up river or down river. 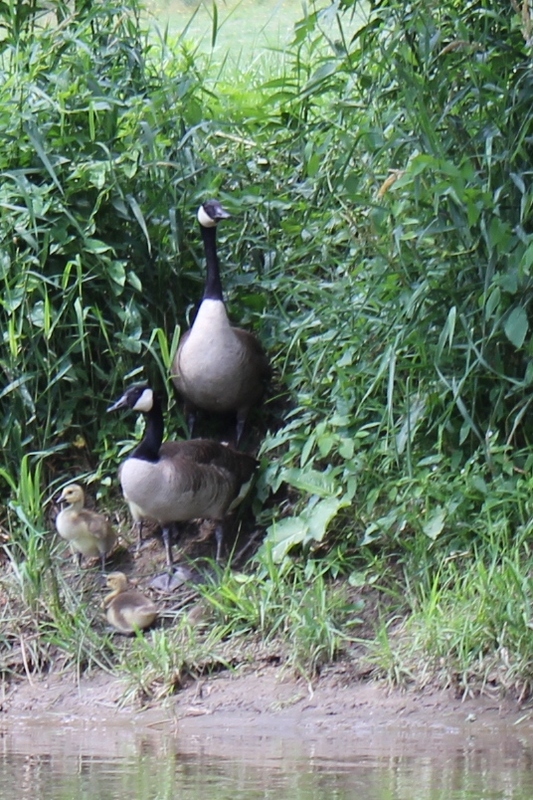 On this paddling trip, we saw geese, beaver or otter, osprey, and ducks. There were also hunting blinds set up in some of the open fields along the river. The water along the 13-mile stretch we paddled was mostly flat or moderate Class I rapids. There were a few submerged rock shelves over which we had to paddle, and we almost bottomed out in a place or two. Overall, this is a nice paddle trip. It may be a bit long for some folks. There are shorter alternatives along this route, and both up river and down river from the section that we completed. The New River State Park has several access points. One thing we did not do, that should be done if you are in the area, is have breakfast or lunch at Shatley Springs Inn, an old inn and restaurant that is a true old-timey place renowned for its family style dining with delicious North Carolina country food. Breakfast at Shatley Springs and/or a canoe trip down the New would be an excellent day trip down from a camping trip in the Mount Rogers National Recreational Area in Virginia. We have in fact done this in the past. 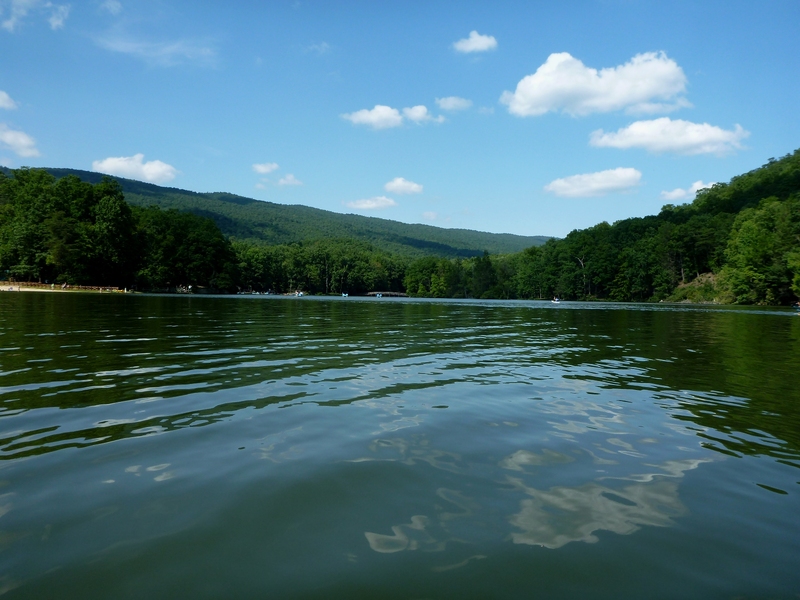 It takes about 1 1/2 hours to drive from Abingdon to the Route 221 Bridge crossing (where the New River State Park is located, and where we rented our canoe). From Abingdon, drive to Damascus, then up Route 58 past the Beartree Lake area. Up on the mountain, Route 58 makes a sharp right-hand turn. You can continue on Route 58 through Whitetop, or instead stay straight on Route 603, aka Konnarock Road. Either one will eventually take you to Route 16/Route 58 south. I prefer going via Route 603 over to Route 16, as it is a straighter road. At Route 16/58 head south to Mouth of Wilson. Drive through Mouth of Wilson. Here Route 16/58 split. 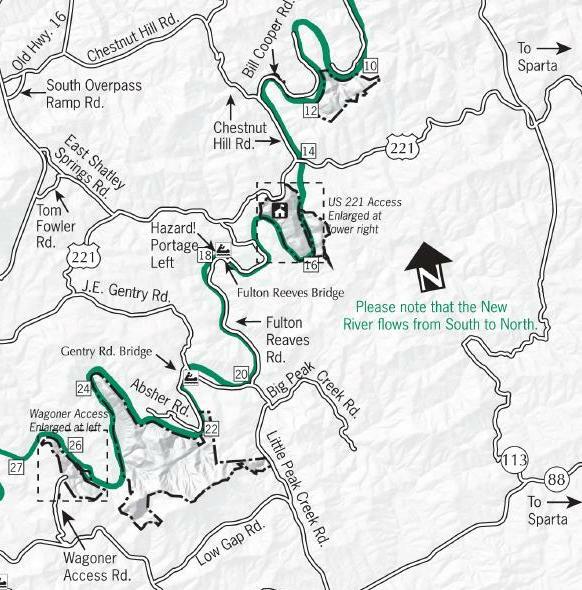 To get to the New River State Park at the Route 221, bear left and stay on Route 58. After about 1 mile there is a junction with Route 93. Turn right on Route 93. This turns into Route 113 at the NC state line. Make a right on Route 221. Route 221 is a very twisty road, taking you through the small community of Scottsville, NC (just a few homes and churches) and after about 5 miles on Route 221 you will see the signs for the New River State Park. A nother mile or so and you will cross the New River. Immediately on the right there is an old General Store with inadequate parking right on Route 221. Behind this store is New River Outfitters. Note: There are plenty of other outfitters in the area. National Geographic makes an excellent map of the entire New River watershed, it is Map 773, New River Blueway, and it contains names of most of the outfitters in NC, VA, and WV with their locations identified clearly on the map. Note: This area of North Carolina is very rural, and the roads are very twisty. Getting around is not intuitive until you know the roads. Carry a good map, use a GPS, etc. In addition, this makes getting to and from the canoe/kayak drop off points difficult. This is another reason using an outfitter in this area is good idea.